No matter how much time and money you have invested in furnishing your property, just a few small additions can add a real touch of class making your home into something even more attractive and special. Whether it is period or contemporary choosing from a wide selection of decorative mouldings and beads will enable you both to integrate and add contrast to your doors, stairs, walls and ceilings. With materials to suit every pocket you can select from either hard or softwood, MDF, and for that special note of elegance to your doors, glass beading. The many styles available mean that you can add a picture or dado rail to add definition to your wall, giving your rooms a more intimate and cosy feeling. Adding an architrave to your door or a ceiling cornice gives a sense of completeness to a room and consequently a warmer sensation. But these products can have a functional purpose too. They can be used to cover rough edges for example when oak moulding is used on a laminate hardwood floor to bridge the expansion gap. 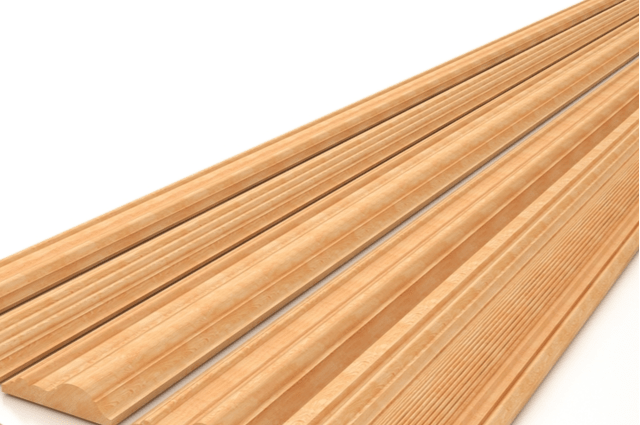 End Piece – Used to integrate a wooden floor to an internal structure or to furniture. T-Bar – To give an attractive finish between two different surfaces on the same level. Threshold – Lending an attractive finish between two different surfaces on two different levels. Stair Nose – Useful for giving a neat edge where a floor meets a step. As well as a large range of trims and beading Theo’s Timber has wood products including Chipboard, Plywood, Bendywood, hard and soft woods as well as oak, walnut and also the increasingly popular Merbau. This is a high density material which develops a rich reddish brown colour as it ages. Although moulding can be purchased in both hard and soft woods, skiting and beading tend to be more available in oak. Some oak products are baked to produce a darker and more uniform colour. More often than not they are unsealed so that the customer can choose the type of finish they require. Using both oak beading and moulding will give a uniformity to the overall effect you are working towards. Whatever you decide, staff at Theo’s Timber have the knowledge and expertise to help you to realise your dream home.